Jason Hartsoe believes that successful art has a firm foundation in the work that has come before it. He builds on and blends seemingly disparate ceramic traditions from around the world and varies these themes into new translations and experimentations. Jason hopes that such referential work can be a reminder that functional forms are necessary and that direct interaction with these objects can have humanizing effects. 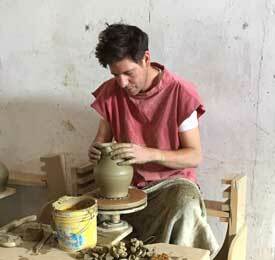 Jason was raised in rural western North Carolina, an area well known for its strong ceramics tradition. Beginning in 2010, Jason worked as an assistant and apprentice to potters including Mieko Sagasaka and Richard Truckle in Tokoname, Japan, Ray Finch at Winchcombe Pottery in England, Dan Finnegan in Virginia and finally Michael Hunt and Naomi Dalglish in North Carolina. He was most recently a Visiting Artist in Cortona, Italy, for the University of Georgia for the year of 2017.